When my cousin was in his 20s, he had crippling back pain that left him no choice but to have major surgery. Fifteen years later, he found himself so exhausted that he couldn’t get out of bed—and doctors had no idea what was wrong with him. He was screened for virtually everything, and after ruling out cancer, he was eventually treated for Hepatitis. It was hard to wrap his mind around the diagnosis of Hepatitis—where did he get Hepatitis? As it turns out, the blood transfusion that was necessary for his back surgery fifteen years prior had given him chronic Hepatitis C. How could this happen? Prior to 1990, blood products were not screened, meaning that anyone who received blood transfusions before this time may have contracted the virus. And because Hepatitis C often doesn’t have any symptoms until it has done irreparable harm to the liver, you could be infected and not know it. In fact, one in 30 baby boomers has the Hepatitis C virus, and most don’t know it. Believe it or not, you can live up to thirty years with the virus with no symptoms at all. At the time my cousin started having symptoms, Hepatitis C hadn’t even been named yet: it was simply called “Not A, Not B.” He was officially diagnosed in the early 90s, and almost lost his life soon after. The virus, combined with the treatment for it, left him unable to work—often unable to even leave his bed—for nearly two decades. Hepatitis C is called a “silent” virus, because it shows very few —if any—symptoms until it has already done major damage. It is spread through direct contact with infected blood, and there is no vaccine. Up to 70% of people with the virus develop serious liver problems. If left untreated, the Hepatitis C virus can lead to cirrhosis of the liver, which has life-threatening complications such as bleeding, ascites (accumulation of fluid in the abdominal cavity), coma, liver cancer, liver failure and death. When a diagnosis is made too late, the only option is a liver transplant. Two blood tests are needed to tell you if you have Hepatitis C.
1) The initial screening test is a blood test that looks for antibodies to the Hepatitis C virus. A non-reactive or negative antibody test result means you are not currently infected with the Hepatitis C virus. 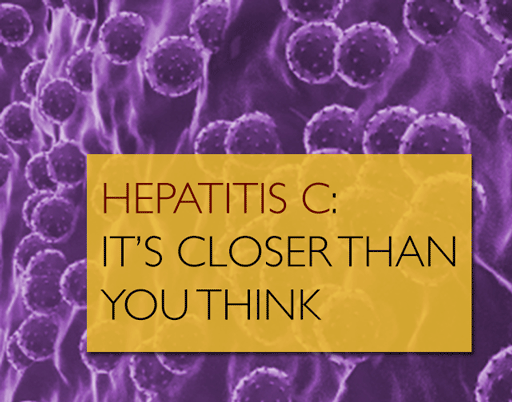 A reactive or positive antibody test result means you are infected with the Hepatitis C virus. 2) If the Hepatitis C Antibody Test is reactive, an additional, follow-up test is needed to see if the virus is currently in the blood. If the additional blood test is Negative, you were infected with Hepatitis C, but the virus has now been cleared your body. If the test is positive, you currently have the virus in your blood and are possibly chronically infected. If, like my cousin, you have chronic Hepatitis C, antiviral medications are used to treat the illness. For others, treatment has improved by adding other medications to the standard antiviral treatment. However, not everyone can benefit from treatment (or need it). It is important to be checked by a doctor experienced in treating chronic Hepatitis C to determine the most appropriate medical care. My cousin was extremely lucky to have survived Hepatitis C—in fact, he nearly didn’t. He was one of the first people to receive the Hepatitis C screening test, which is now readily available. Get tested if you haven’t been already! It could save your life.